This summer is just beautiful, at least with regard to the weather. We had many sunny, hot days. Typically end of July, early August, the rains start. However, we still have wonderful sunny sky. This summer, we even could enjoy sitting outside after the dragonflies came and hence the number of mosquitoes went down. We could sit outside as the winds were favorable and did not blow often polluted air from wildfire into the Fairbanks area. Despite of the Stuart Creek fire that burned close to Fairbanks, we only had a couple of days on which the air smelled badly – or as a friend of mine said “It smells like summer in Fairbanks”. Living in Fairbanks one is used to the cold, but suffers when it gets above 80F (26.7C). Then one wants to wear shorts and a tank top or a sundress. However, this does not work when you have a meeting at work. 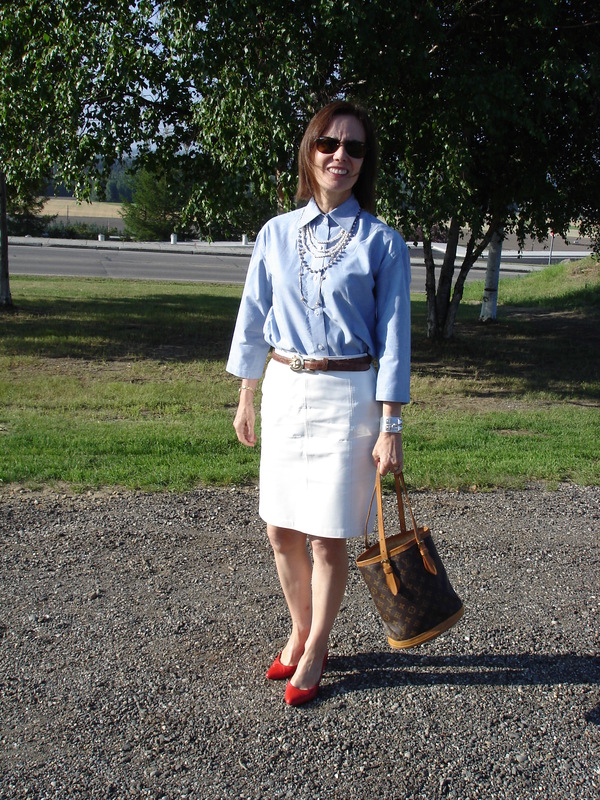 Here I “fight” the heat in a 3/4 sleeve button down shirt, a white leather skirt and red pumps. Since I did not want to wear a blazer, but wanted to nevertheless look professional and serious, I added several strings of pearls – the women’s tie as my husband calls pearl necklaces. The tan of the Kieselstein Cord belt is picked up by the bucket Louis Vuitton bag.